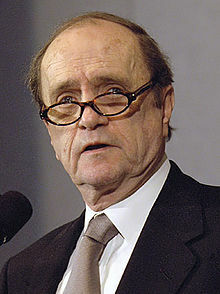 Bob Newhart (born September 5, 1929) is an American actor and stand up comedian. He has performed on many television sitcoms. One of them was his self-titled sitcom The Bob Newhart Show. He also appeared in the Christmas comedy movie Elf. In 2011, Newhart made a cameo in the movie Horrible Bosses, and in 2013 he guest starred in an episode of The Big Bang Theory, for which he won his very first acting Emmy Award on September 15, 2013. Newhart was born in Oak Park, Illinois on September 5, 1929. He was raised in Chicago, Illinois. Newhart studied at Loyola University at Chicago. He served in the United States Army before his acting career began. Newhart has been married to Virginia Quinn since 1963. They have four children. ↑ "Bob Newhart finally gets his Emmy Award". Washington Times. Retrieved 16 September 2013. This page was last changed on 30 August 2017, at 22:12.